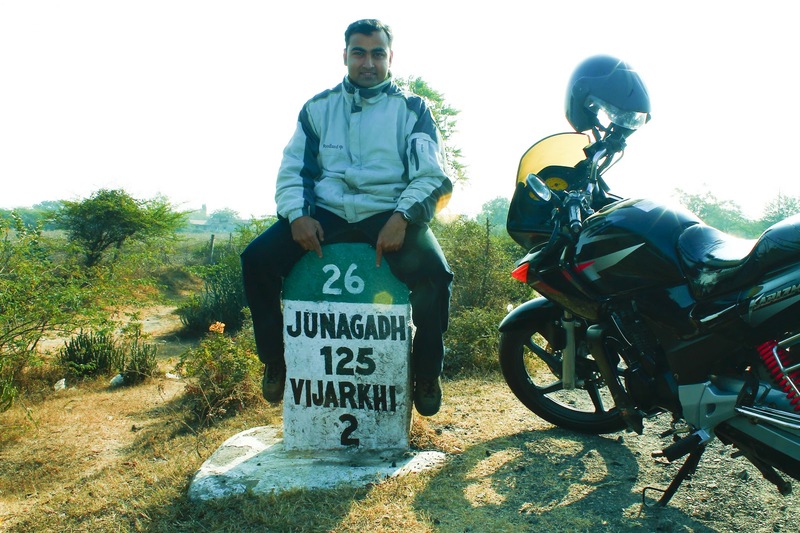 Junagarh was high on a weekend plan from Jamnagar. SC Sharma, a coursemate and self , we thought that we have had enough of training per week and wanted to enjoy the weekend burning our bums on some nice leather. So we decided that it was Junagarh..
Anupam Dakua , bless his soul , very graciously offered us his beloved Karizma for the trip and after some last minute motivational talk provided by yours truly to SC on 30th night..We packed our bags for a whirlwind tour to Junagarh and back. The whirlwind was supposed to start at 0700 in morning but whirlwind over slept . And the wind started at 0900. After a bit of local navigation through jamnagar and we were off . SC was driving the first phase. After a few photo ops on the way we made good time till a place which had a temple called Sitamata temple. The funny part of this temple as I noticed was that part of the temple was typical jain archietecture(layerings on the wall) , a part of the temple was dome (pure dome) which was very very mughal and a part was like some old rustic house. It was like a frankenstien monster with individually beautiful parts and a hideous combo. And to top it all there was just no Sitamata in the temple. Turned out that it was some nagdevi(wtf)!! The time was around 1030 and in the time honoured tradition of 'stand easy'..we stood easy at a tea stall for some tea and 'stuff'. Turned out that the only stuff he had was Ganthia, a kind of besan based crispy. We ordered a plate and tea. The ganthia surprisingly turned out to be quite eatable and the tea was first rate. [on a side thought, one thing you can never ever go wrong is tea on an indian road]. After a break at the temple and lots of shooting photos we started on a right turn towards Junagarh. Many eventfull miles and a bit of sore bums later , we arrived at the fabled town of junagarh gates. Now there were two paths available to us . We could go to junagarh and see the Umerkot fort or take a diversion to Girnar Talej and start the climb to the amba devi temple on top. (for an aethiest, the number of temples I have been to would make my religious mother cry with pride). I like climbs(it screws up your legs and makes your mind go blank..a cheaper alternate to hallucinogens). 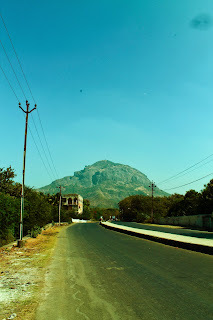 So we drive towards Girnar Talej. Now as we turned left , we could see the looming mountains at a distance. This was such a welcome change to the otherwise featureless Gujju skyline. But as we neared , the girnar mountain kind of grew bigger and bigger. And somewhere on top there was this tiny weeny temple. Somehow it didnt seem too inviting. So to gather a bit of motivation we stopped enroute to ask a father son duo sunbasking(at 1:30 pm in afternoon????) as to how was the climb? "4 ghante lagte hain , abhi jaoge to kal hi laut paoge"(it takes 4 hrs to get on top , so you better plan to come down the next day). We were like 'ok fine but what if we start climbing today and want to come down today itself'? I mean seriously gujjus do have a sense of humor. Sher khaa gaya to gurantee nahin!! Anyway we reach the base at around 2 pm. Buy a bottle of water and deposit our helmets at a shop selling religious items and then start the climb. The plan is to reach back and then go for lunch. And so the climb starts. SC carries the bag and water. I get my DSLR out and we are on our way. The stairs are comfortably spaced and groves are cut into it to give a grip. There are shops on way selling nimbupani and water..and chips. One thing that really saddens me is the amount of dirt in such places. Especially packets of chips. Anyway I have really no hope for the religious idiots so I dont expect too much of personal hygiene at such places either. I concentrate on my camera and trudge on. In between , we stop and I take some real good shots. The sky becomes bluer as we start gaining height. Anyway at approx 4 pm we reach the top and my altimeter watch says 1000m (we had started at 170 m ). Not bad . We walk around . 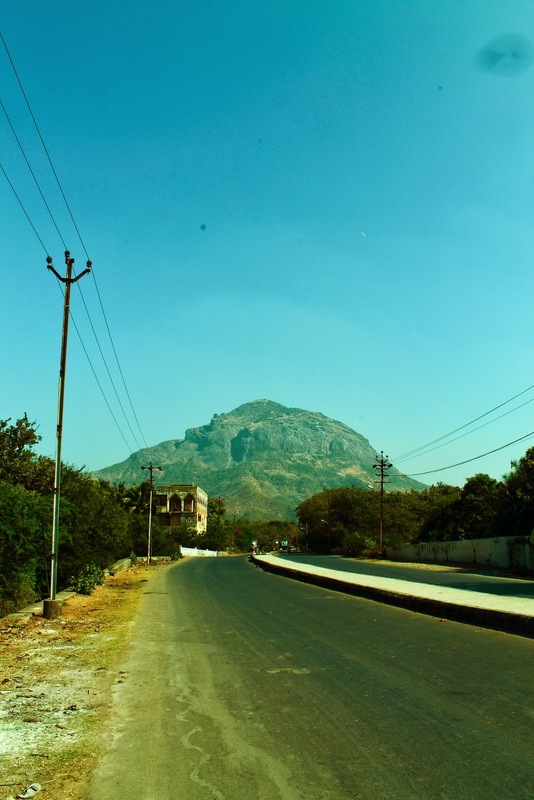 the entire top of the mountain is a conglomeration of jain and hindu temples. Jain temples are exquisite but dead and locked. The amba temple is small but is in use(no photography please). We explore a bit and then move back. Climb down takes almost exactly the same time as climb up. As we reach down , and ask for our helmets , the shop keeper almost falls off his chair . 'Upar tak jaake wapas aa gaye?' ..(yes!).... 'poora upar tak gaye the?'.... (where else?)...'accha'. I have a feeling that most people here do not do it as normal practice.We do a bit of stretching and cooling down and we are back on our bikes. Anyway we are back and we are hungry and we need some decent lunch. A thali perhaps. No such luck. Most restaurants are done with lunch (its approx 6 pm) and we are in no mood for snacks. Just to satiate our hunger pangs we stop by a chat wala and order a dahipuri. Now the dahi puri in most parts of India is basically the luchi(or poori), filled with sev, onions , aloo and a load of dahi. Here everything is in order except that 'load' of dahi is like a drop of dahi. I give a puzzled look to the vedor..he puts in another drop.Thats it? thats it!! We ask him for directions to a good hotel and he points to a road. We ride on and on till we are bang inside junagarh. No hotel to be found. We run into a 'pure non-veg' hotel which has no veg menu. Am a bit about non-veg so I ask for a veggie restaurant and he points us towards a place called Gita lodge(has good quality thali). We reach there and it seems that it will take another half an hour to start the preps. We are so disgusted that we vote to start right back to Jamnagar as it was getting darker. So we start in full earnest only to realise that not only was it getting darker but also very very colder! To cut a long story short...after around 3 hours of balls freezing drive we arrive at deepak Juice centre at jamnagar. We down a chikoo shake and start for Valsura. New year ball is in full swing and we are planning on joining it. We quickly take bath change and greet the new year with Kullu and family in high spirits . Our thighs are jammed and knees are frozen but hey ...what are weekends for!! Awesome way to spend the weekend....!! Reminded me of our Rajgadh trek. The sun bathing father son duo surely under-estimated your enthu. 'Upar tak jaake wapas aa gaye?'.. 'poora upar tak gaye the?'.. usko bolna tha ... "Sher ko bhi mar dala.!!!"